Hello! 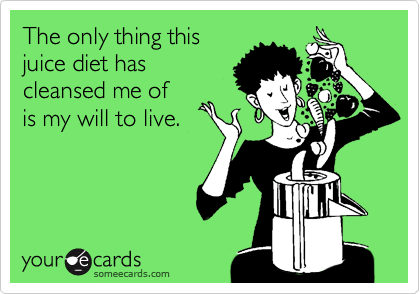 My goal is to provide, and be provided with, daily support throughout the juice cleanse process. A means to promote health, knowledge, well-being, mood support; and conquer personal struggles with food, allergens, body image, and nutritional deficits. Humor welcome! Day 1 effective 3/1/14. All are welcome to join at any time, to support and be supported! earlier today, i was too tired to be concerned with reporting on day 2, however, i'm finding myself (brace yourself for the over-share) extremely constipated! really?! i have experienced this before, related to chia seeds; but no where near as intense. i'm mentally preparing for a miserably long, uncomfortable, sleep deprived day at work tomorrow. ways i think i went wrong: too much chia in my 'workout' juices and using green bananas (supposedly they have more potassium and overall reduced glycemic load related to insoluble fiber). for those with the same, lazy peristaltic function; i use Aeorbic Life's Mag07 Oxygen Cleanse capsules semi-regularly. i just downed 5 of them. anyway, last night i spent $118.00 and some change at Kroger. i stocked up on organic kale, spinach, bananas, lemons, coconuts, mangoes, granny smith apples, beets, radishes, onion, tomatoes, cucumber, raw almonds and cashews, avocados, oranges, parsley, cilantro, carrots, almond milk, sweet potatoes, and dates. i also purchased 6 vintage tinted 16 oz mason jars (i'm a sucker for anything vintage inspired) and a 12 pack of 32 oz mason jars (accounting for about 24$ of the bill) to pre-make and freeze juices/smoothies. a lot of things really turn out like smoothies in the vitamix-especially if you're trying to increase the protein and fat content through nuts, kefir, my guilty pleasure legume-peanut butter powder; and unsweetened almond milk. the alternate size/color system worked out well. i created drinks, largely based of Joe's recipes (Garden Variety; Un-Beet-able; Carrot-Apple-Lemon, Green Lemonade, Pumping Iron; and my own random creation involving coconut, mango, orange, banana, spinach, kefir, and almond milk). the higher fat/protein content drinks intended for the gym went into the smaller, blue mason jars; and the lower calorie, higher water content drinks went into the 32 oz jars. 1. parsley, lime, small juicing orange; kale; small chunk of ginger; blended in the VItamix with berry detox tea, and one organic stevia packet. 2. kale, small, frozen green banana; a couple tablespoons powdered peanut butter; a serving of amazing grass chocolate powder; and about 1/2 c. each of plain, unsweetened kefir/vanilla almond milk, and one packet of stevia. currently drinking coffee with almond milk and stevia-no sense in becoming homicidal AND suicidal. i didn't realize i was starting a cleanse effective today, until Joe Cross fell into my lap, by way of my laptop computer and Netflix. 3. handling workouts without a feeling of eminent death. insert spirulina into my amazon prime shopping cart, now. plan for tomorrow involves: kale, parsley, orange, with a green tea base. starting with a 5 day goal, with high hopes of going far beyond that!